The data in this example should raise some questions for the auditor before he ever visits the facility. The greenhouse appears to use a lot of energy; it uses more than the child development center and almost as much as the undergraduate dormitory. Since the greenhouse is not particularly large, this data raised a red flag for the energy auditor. Because one should never make assumptions about what is actually using the energy, the auditor checked the gas consumption meter at the greenhouse to make sure it was not measuring gas consumption from somewhere else as well. Subsequent investigation revealed that the heating and cooling in the greenhouse were controlled by different thermostats. One thermostat turned the cooling on when the temperature got too high—but before the second thermostat had turned the heat off! If it had turned out that the gas use from several other buildings had been metered by the same meter as the greenhouse, it would have been necessary to find a way to allocate gas consumption to each building. In this example, the amount of energy used in the president's house could also be questioned; it uses nearly as much gas as the child development center. Perhaps the president's home is used for activities that would warrant this much gas use, but some equipment problem might also be causing this difference, so an energy audit of this facility might be worthwhile. Another way to present the data is in graph form. A sample of the type of graph that should be made for each type of energy is shown in Figure 2-3. Each area of the country and each different industry type has a unique pattern of energy consumption, and presenting the data as shown in Figure 2-3 helps in defining and analyzing these patterns. 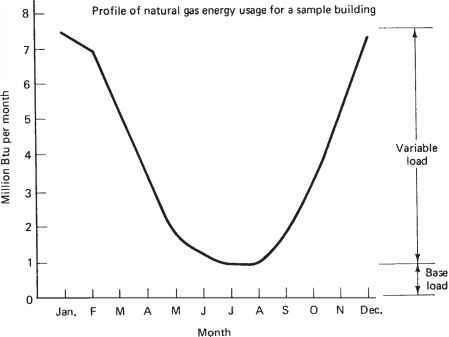 In the facility from which this example came, natural gas is used in the winter for space heating, so the January peak is not surprising. For electrical consumption, if a peak demand charge is based on the annual peak, the energy auditor must know the time and size of this peak in order to address measures to reduce it. tions. 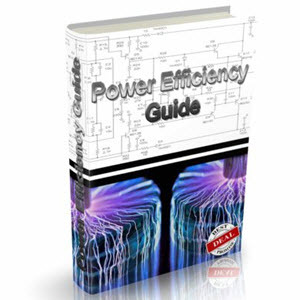 This examination of energy rate structures is explained in detail in Chapter 3. The geographic location of the facility should be noted, together with the weather data for that location. The local weather station, the local utility or the state energy office can provide the average degree days for heating and cooling for that location for the past twelve months. This degree-day data will be very useful in analyzing the energy needed for heating or cooling the facility. Heating degree days (HDD) and cooling degree days (CDD) are given separately, and are specific to a particular geographic location. The degree day concept assumes that the average building has a desired indoor temperature of 70°F, and that 5°F of this is supplied by internal heat sources such as lights, appliances, equipment, and people. Thus, the base for computing HDD is 65°F. The actual calculation of HDD for an entire year is more involved than this example. HDD for a year are found by taking the outside temperature each hour of the heating season, subtracting that temperature from 65°F, and summing up all of these hourly increments to find the total number of degree hours. This total is then divided by 24 to get the number of HDD. Cooling degree days are similar, using 65°F as the base, and finding the number of hours that the outside temperature is above 65°F, and dividing this by 24 to get the total CDD . Bin weather data is also useful if a thermal envelope simulation of the facility is going to be performed as part of the audit. Weather data for a specific geographic location has been statistically analyzed and the results grouped in cells or bins. These bins contain the number of hours that the outside temperature was within a certain range (e.g. 500 hours at 90-95°). This data is called bin weather data and is available for a large number of locations throughout the United States . Next the facility layout or plan should be obtained, and reviewed to determine the facility size, floor plan, and construction features such as wall and roof material and insulation levels, as well as door and window sizes and construction. A set of building plans could supply this information in sufficient detail. It is important to make sure the plans reflect the "as-built" features of the facility, since the original building plans seldom are completed without alterations. Operating hours for the facility should also be obtained. How many shifts does the facility run? Is there only a single shift? Are there two? Three? Knowing the operating hours in advance allows some determination as to whether any loads could be shifted to off-peak times. Adding a second shift can often reduce energy bills because the energy costs during second and third shifts are usually substantially cheaper. See Chapter Three for an explanation of on-peak and off-peak electric rates. Finally, the auditor should get an equipment list for the facility and review it before conducting the audit. All large pieces of energy-consuming equipment such as heaters, boilers, air conditioners, chillers, water heaters, and specific process-related equipment should be identified. This list, together with data on operational uses of the equipment allows the auditor to gain a good understanding of the major energy-consuming tasks or equipment at the facility. The equipment found at an audit location will depend greatly on the type of facility involved. Residential audits for single-family dwellings generally involve small lighting, heating, air conditioning and refrigeration systems. Commercial operations such as grocery stores, office buildings and shopping centers usually have equipment similar to residences, but the equipment is much larger in size and in energy use. Large residential structures such as apartment buildings have heating, air conditioning and lighting systems that are closer in size to commercial systems. Some commercial audits will require an examination of specialized business equipment that is substantially different from the equipment found in residences. Industrial auditors encounter the most complex equipment. Commercial-scale lighting, heating, air conditioning and refrigeration, as well as office business equipment, is generally used at most industrial facilities. The major difference is in the highly specialized equipment used for the industrial production processes. This can include equipment that is used for such processes as chemical mixing and blending, metal plating and treatment, welding, plastic injection molding, paper making and printing, metal refining, electronic assembly, or making glass.